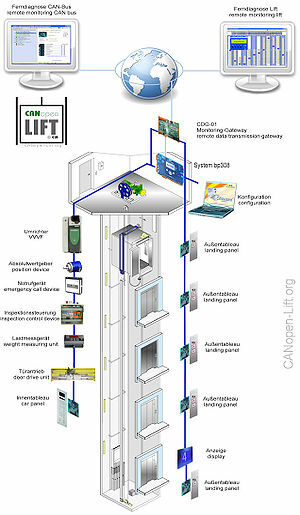 At this site you can get information about the CANopen technology used in a lift. Here we discuss questions about the application profile, technical solutions, [[CANopen-Lift:Portal|products]] and applications and we will present some [[Reference List|references]] with this technology. An overview about the articles in this [[Wiki]] you can find at the [[CANopen-Lift:Portal|Community portal]] and at the [[Spezial:Categories|Site categories]]. An overview about the articles in this [[Wiki]] you can find at the [[CANopen-Lift:Community_Portal|Community portal]] and at the [[Spezial:Categories|Site categories]]. At this time, the wiki is available in two languages. In 2002 we start with a german website and in 2005 with a german wiki. Now the technology becommes more and more interessting in manny countries of the world and so we start to build up also an english wiki. At this time you will find the most information at the german part of this wiki but we work hard to translate everything. If you would like to help us, please contact the [[Webmin]]. We wish you manny interessting information and creative ideas - Your [[Webmin]]. This Wiki is attended by the CANopen-Lift-Community and the members of the SIG Lift. You are cordially invited to add your own content only to this subject. How you can do this, you can see at the article Write in this Wiki. At this time, the wiki is available in two languages. In 2002 we start with a german website and in 2005 with a german wiki. Now the technology becommes more and more interessting in manny countries of the world and so we start to build up also an english wiki. At this time you will find the most information at the german part of this wiki but we work hard to translate everything. If you would like to help us, please contact the Webmin. We wish you manny interessting information and creative ideas - Your Webmin.